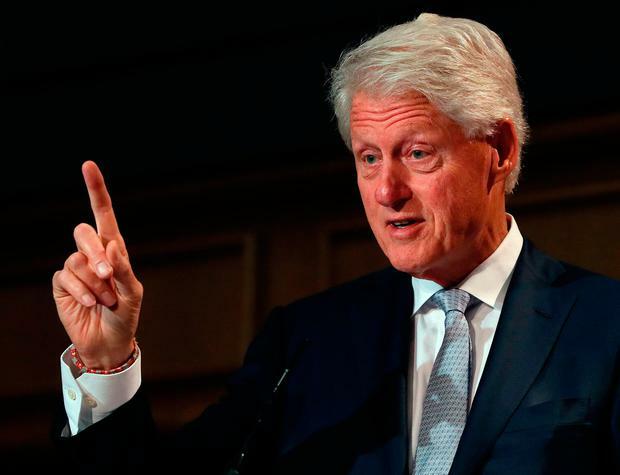 Former US president Bill Clinton says he does not blame Northern Ireland politicians for their failure to create a government, due to the huge uncertainties surrounding Brexit. Mr Clinton said that without knowing what will come from the UK leaving the EU, the power-sharing parties in the North would not be able to come to an agreement. Speaking at an event to celebrate 50 years of aid agency Concern Worldwide, Mr Clinton said: "We all know now that there's not a government there, but if you were a Northern Irish politician... and the parties were more or less equally divided, you probably wouldn't want to go into government right now either until you knew what the details of Brexit were, how it would affect Northern Ireland, how it would affect the relationship between Northern Ireland and the Republic, because how would you know what the terms of agreement would be." Mr Clinton added: "Nobody wants to go back to the bad old days. "So I think we should just, everybody, take a deep breath, keep the agenda out there and keep working. That's all-important." The former US president was introduced onto the stage at Dublin Castle by businessman Denis O'Brien, who praised Mr Clinton for his lifetime of public service and in recent years as a private citizen helping the marginalised. Earlier in the day, President Michael D Higgins warned of "a new arms race" among some permanent members of the UN Security Council. Mr Higgins said: "The arms industry now exports weapons of death and destruction for use in Syria, the Democratic Republic of Congo and Yemen. "The self-defeating rhetoric of the arms race, and the immorality of the arms trade, only serve to fuel current and future wars."